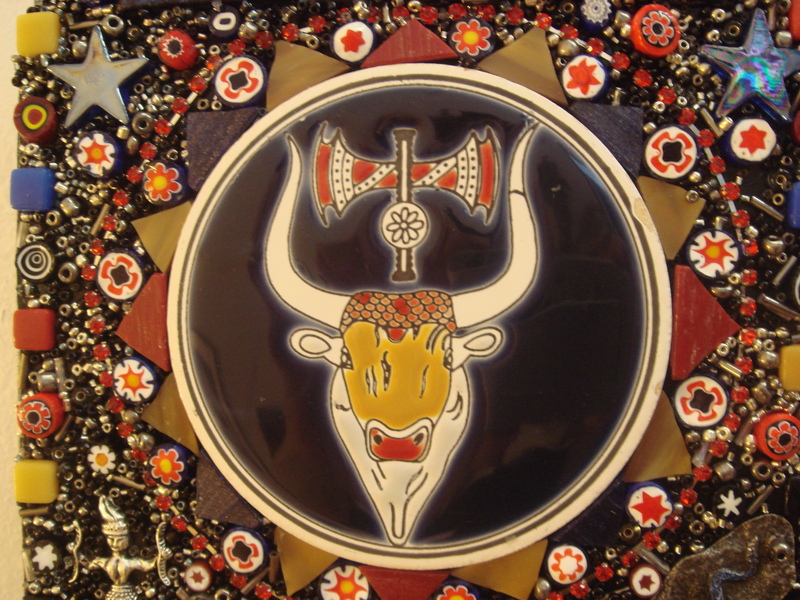 I just finished this mixed media mosaic last night as I watched the the ball drop in Times Square- it’s called “Sometimes you just have to take the Bull by the Horns and Leap!” The piece consists of a bull and labrys image from a found coaster from Crete, mileflore glass, pewter, black and silver glass beads, a silver Cretan Snake Goddess and a pewter snake charm. 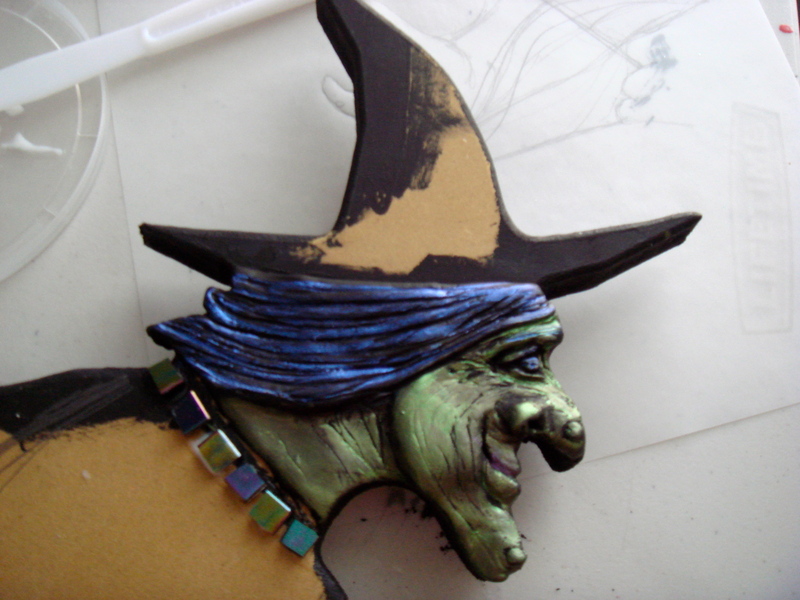 The words are stamped on Ames Apoxie Sculpt that is painted with Golden interference Blue on a recycled wood form. 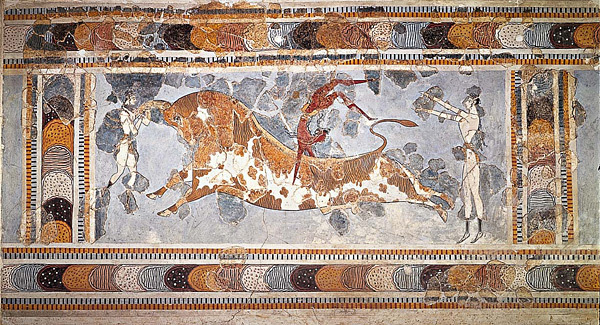 The Bull Leapers in ancient Minoan Crete would perform rituals consisting of daring acrobatic leaping over bulls. They would grasp the bull’s horns which made the bull violently jerk his neck upwards giving them the necessary momentum to then somersault up landing on the back of the bull, from there they would do a back flip off onto the ground. The labrys is one of the oldest images of Greek civilization depicting a double headed axe. The archeologist, Marija Gimbutas discovered that this symbol goes back a lot farther to Neolithic Anatolia and interpreted it to be a symbol of the great Mother Goddess, with the two curved edges representing the waxing and waning crescents of the moon. 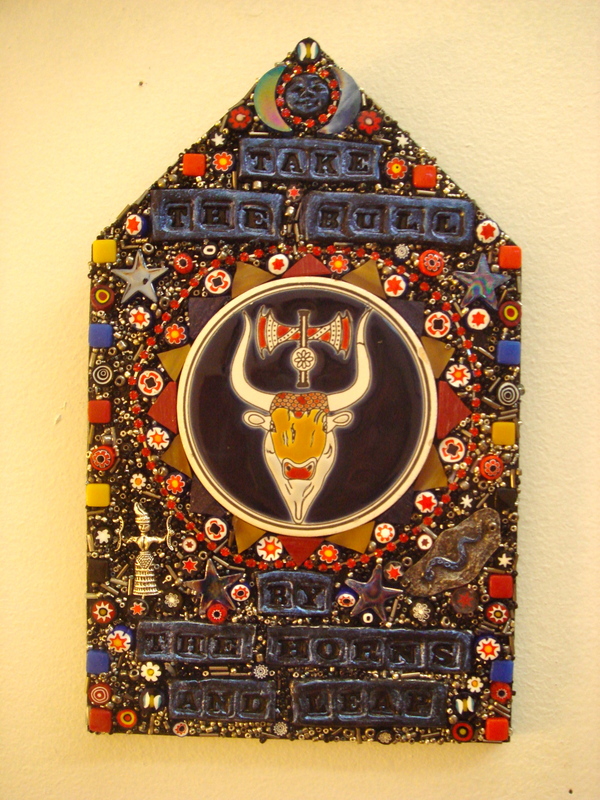 I’ve decided that “Take the Bull by the Horns and Leap!” will be a good motto for 2012- a leap year! Merry Yuletide to you all! 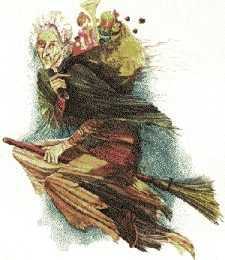 I’d like to share with you a post that I wrote for my She Who Oracle blog last Yule, it’s recent wonderful discovery for me, the Italian Witch and Gift Bringer, Befana. I have Italian ancestors, my Mum’s Dad was half Italian, so I feel like I’ve discovered a little of my heritage but more than that I’ve discovered a positive image of a witch, an ancient crone at that, and a lovely story to tell Alice. La Befana flies through the night carrying a basket full of goodies, comes down chimneys and brings presents to children- sound familiar? 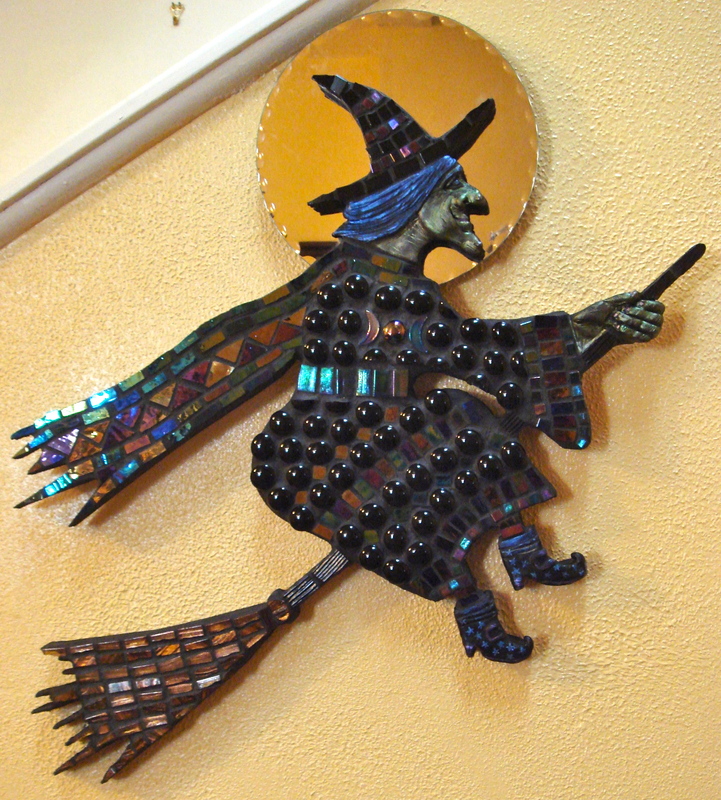 But she flies on her broom! Under a slightly different name she may have also been a fairy Godmother. Befina was a celtic fae that visited the cradle of new born babies to bestow upon them talents and made predictions of their future. 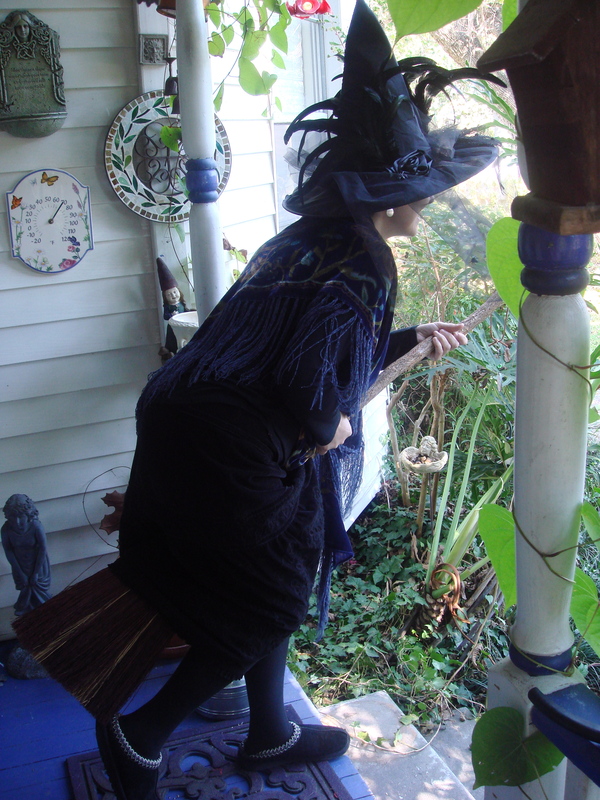 May La Befana Visit you all! For the past few years I would head up to PineCrone Labyrinth and Retreat Center in Bastrop, Texas to hold a Our Lady of Guadalupe Day weekend, sacred art workshop. My dear friend Fern dedicated Pine Crone to Our Lady of Guadalupe and every year on this day she would honor her. As PineCrone was lost in the Bastrop Wildfires this summer and Fern passed away in June, I just couldn’t seem to get my self together this year to plan and hold the Guadalupe Day workshop any place else but I’ve been working on a mixed media mosaic to memorialize the place and my friend and these details are from that piece. 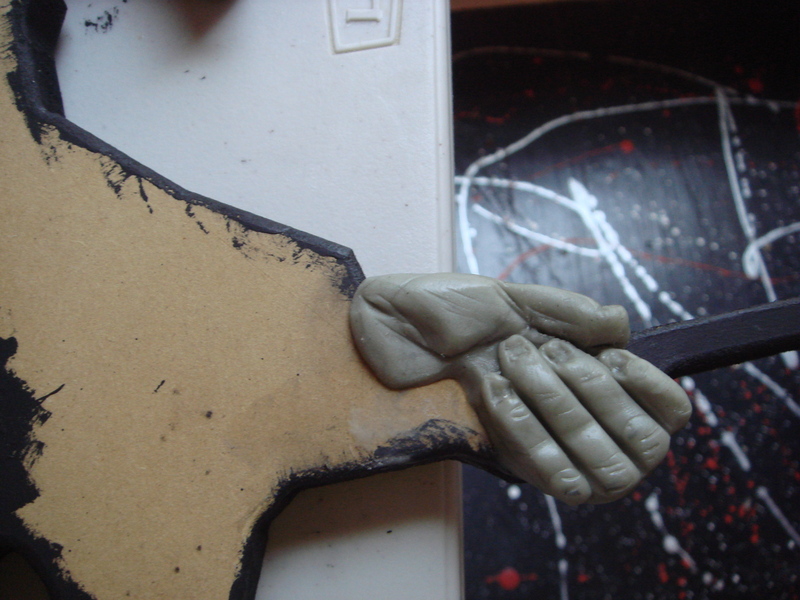 I’m not ready to completely unveil it yet as I still have a lot more work to do on it. Our Lady of Guadalupe is always shown within the glorious golden light of her mandorla. In my research have found that a mandorla is a doorway and Our lady of Gualdalupe is a portal Goddess. Portal goddesses lead us into a religion and from there they open the doors to a wider and infinitely deeper spiritual space. The Mandorlais an ancient symbol of two circles coming together and where they overlap an almond shape is formed in the middle. 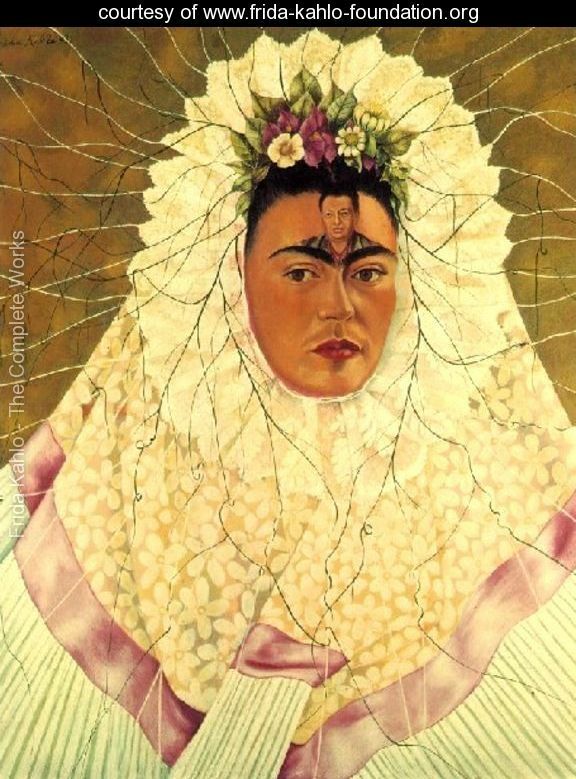 It is also a variant of a halo which surrounds the whole body of a holy person also known as the Aureola. 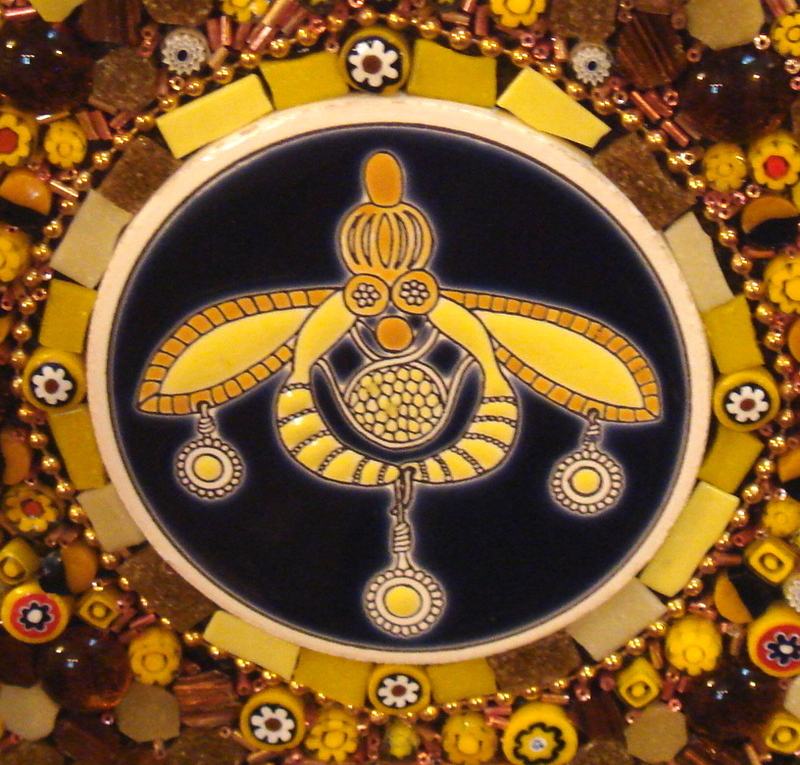 The Mandorla “Almond,” (mandorla is the Italian word for almond) is also called vesica~ piscis, the Vessel of the Fish. Almonds were holy symbols because of their female, yonic connotations. Almonds were believed to have the power of virgin motherhood, as shown by the myth of Nana, who conceived the god Attis with her own almond. During medieval times, the almond was interpreted as a symbol of the embryo enclosed in the uterus. To the Pythagoreans, the Vesica~ Piscis was literally the womb of the universe, the ever unfolding Mother of Sacred Geometry. A Vesica Piscis is on the cover of the Chalice Well in Glastonbury, England. The Chalice well is a spring, in continuous use for thousands of years, which has become a symbol of the flow of eternal life, and of nature constantly renewing itself. 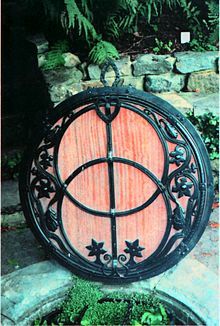 The ancient Celts believed wells to be doorways to the other world, a place where the veils between human existence and the greater spirit became thinner, and communications could take place with the gods and goddesses. 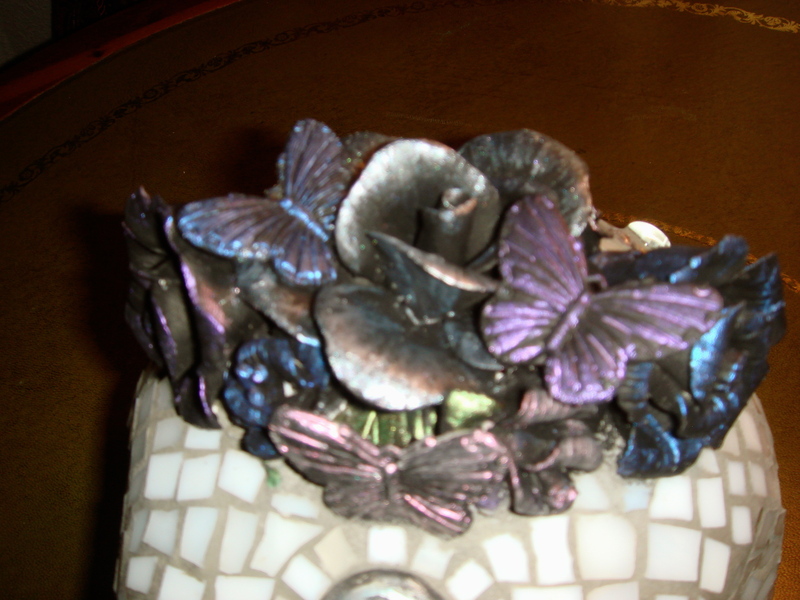 The mandorla symbolizes the point at which two clearly separate worlds meet and intersect. The center of the Mandorla, represents liminal space, the threshold of the doorway or portal between the worlds, between the inner world and the outer world, between the magical and the mundane. It is the divine container in which new creation begins to form and germinate. This is the womb, the moment of creation, where something seems to come from nothing. This ancient symbol appears in the images and myths of cultures from around the world, from the Orient to old Celtic tribes of Europe. Ancient mandorlas in art represented the mysterious feminine aspect of life as a sacred womb, a portal between the realm of spirit and the realm of matter through which all life passes into this world. 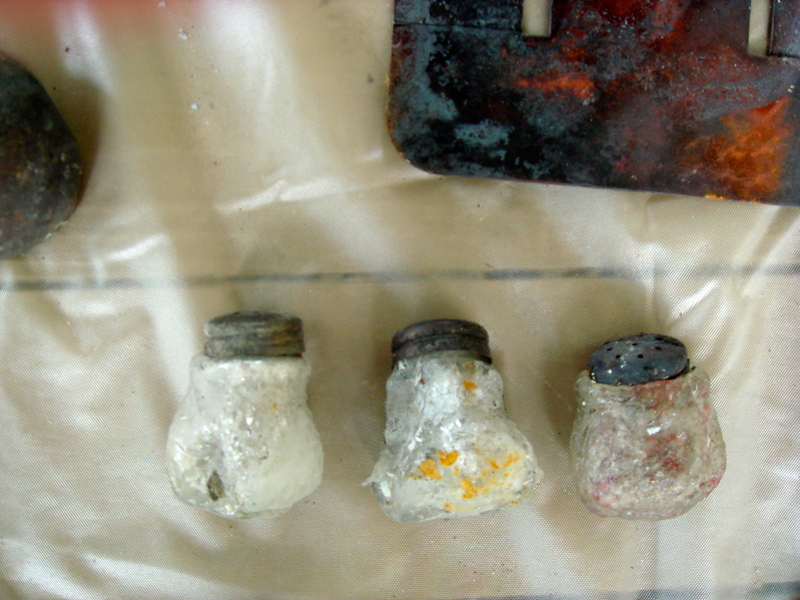 Meditating on the Mandorla can bring about transformation: in our bodies and spirits if we use them for healing, and in our whole life if we use them in our art. 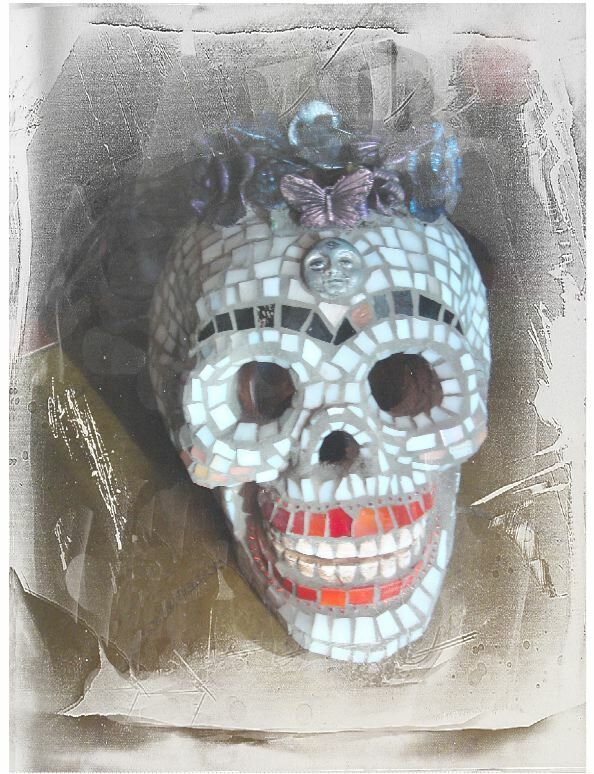 In honor of Dia De Los Muertos or Day of the Dead, (November 1st and 2nd) I’ve created a mixed mosaic calavera or skull as a tribute to the great Mexican artist Frida Kahlo. May we remember today all our loved ones who have passed. 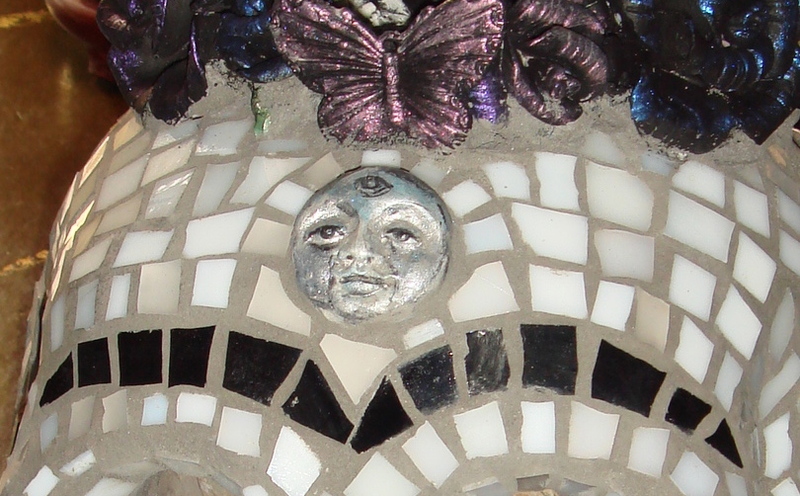 This mixed media mosaic with iridescent glass tile and black gems has a sculpted face, hands and boots made from Apoxie Sculpt, they are then painted black followed with Golden acrylic interference paints. 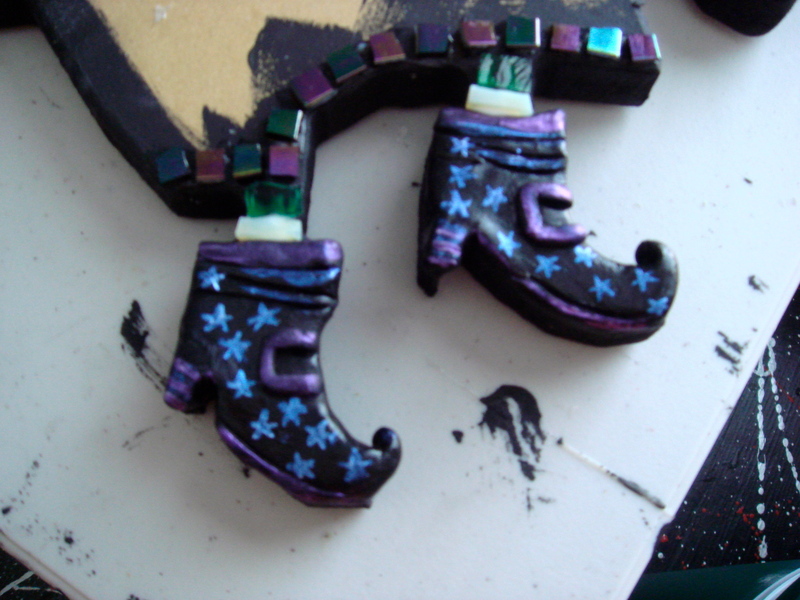 ( I just found out that Apoxie sculpt comes in black and many other colors). 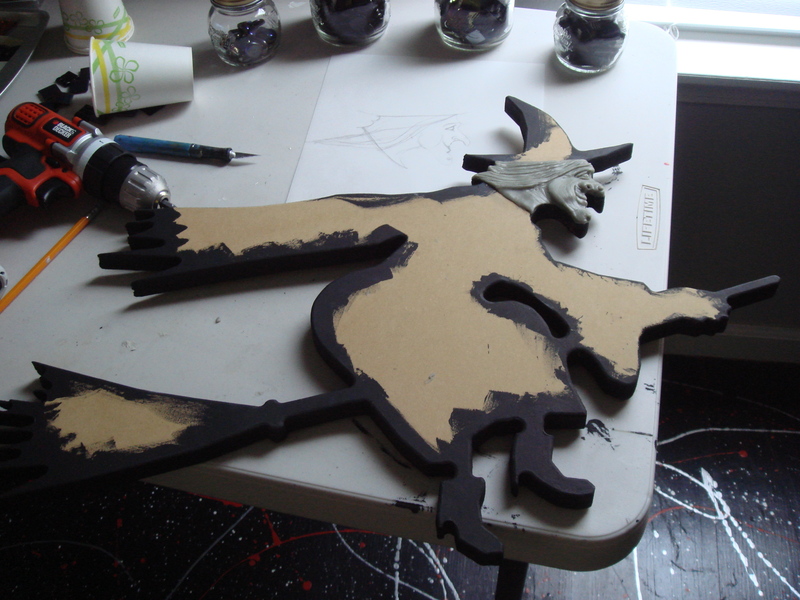 It’s all applied to a MDF cut out form. The disc behind her head is a mirror- (it’s the wall that’s reflected in the mirror that makes it look like a pumpkin! And no the opposite wall is not really that color it’s the same as behind the witch). Well I’m off now- got to fly! I have a thing with bees, they are a metaphor for me for stick-to-itness, the tenacious little buggers come to my studio every Spring and attempt to make a hive in the dormer. 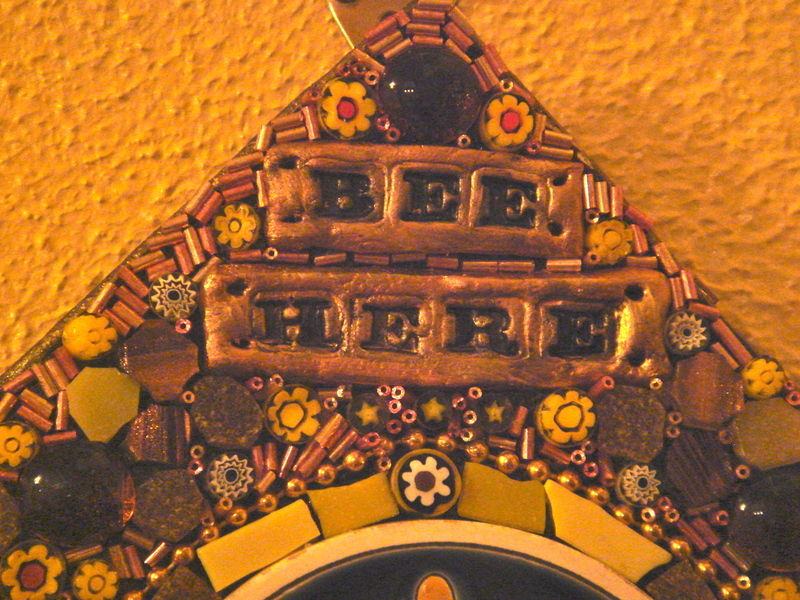 I might be taking a chance calling this mixed media mosaic piece “Bee Here Now” as I would prefer they make their hive someplace else, like down the bottom of the garden, but I wanted to make a piece that is a daily reminder to stay in the present moment and make each minute count as you never know when it may be your last. 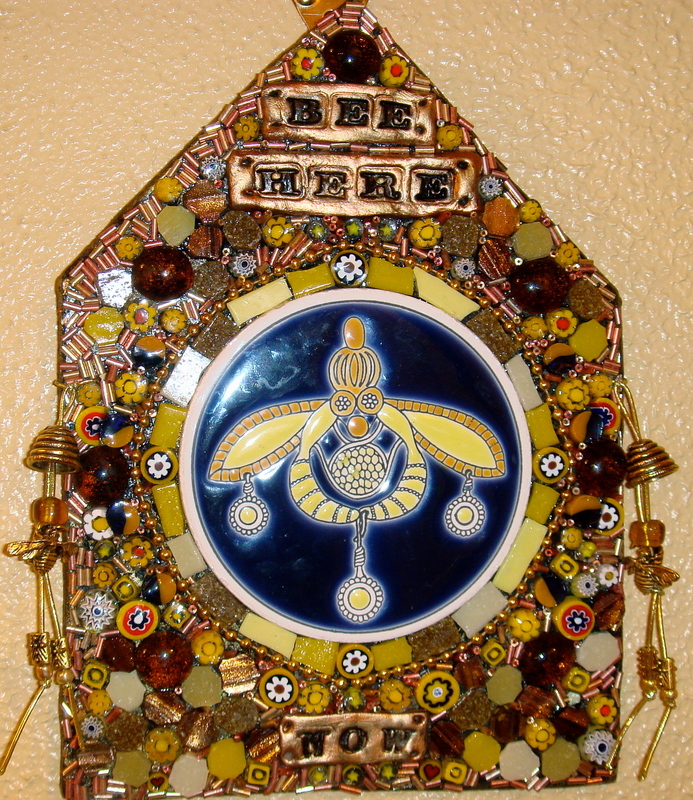 The central bee image is from a set of porcelain coasters that made their way into a garage sale. I guess they didn’t realize that they were selling off such a rare and ancient treasure, it’s an image of a bronze age, Minoan bee pendant found at the Heraklion Museum in Crete. 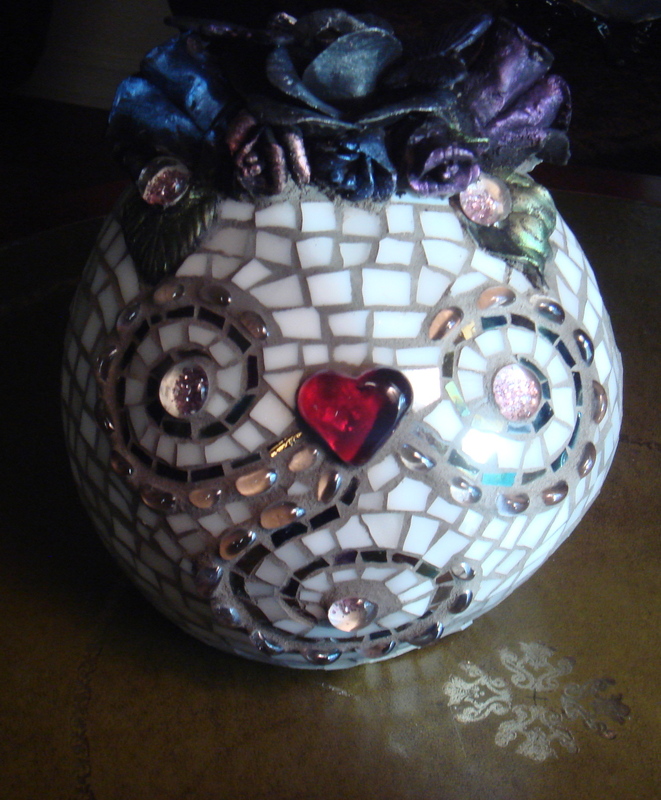 I used Millefiori (thousand flowers), a glass work technique that was lost and then revived in the nineteenth century in Venice, Italy. 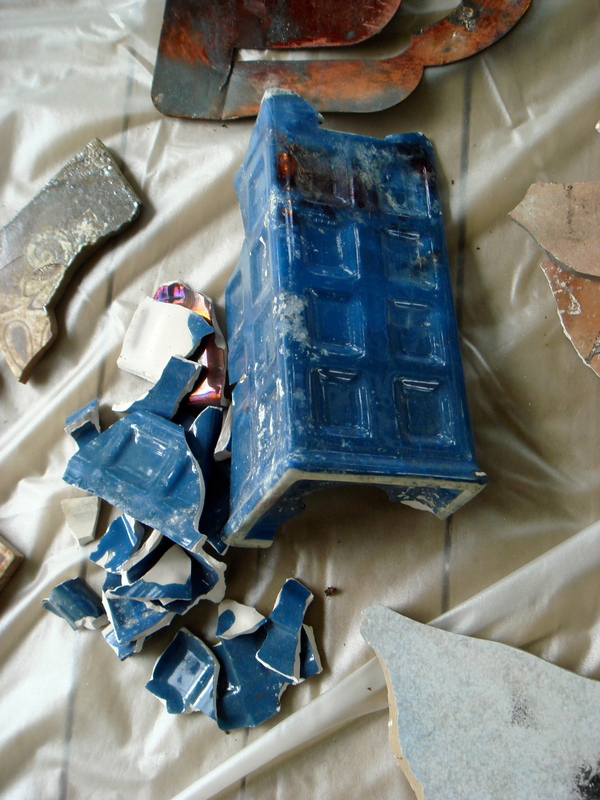 Originally it was made as far back as the Ancient Egyptians, Romans and Phoenicians. Millefiori was treasured and traded a lot and has been found far away from it’s origins, as in the sixth and seventh centurySutton Hoo Anglo Saxon hoard in England and in eighth century archeological sites in Ireland. You never know, (meaning: I Googled it and couldn’t find anything, so I’m just guessing) it probably found its way to ancient Crete as they were traders and seafarers themselves. I got the title for this piece from a book called “Be Here Now” (published in 1971) by Dr. Richard Alpert, known as Baba Ram Dass or now, just plain old Ram Dass. It became one of the Hippie must reads and was known as a “counterculture bible”. It’s part autobiographical as well as an attempt to teach Hindu spirituality, yogic philosophy and meditative practices to non Hindus, most of who, at the time, were totally unfamiliar with these concepts and some of who were totally stoned out of their gourds. My dear friend Fern, who passed away in June, owned and ran the PineCrone Labyrinth and Retreat Center at her home in Bastrop Texas. It was totally destroyed last month, burned in the Texas wildfires. 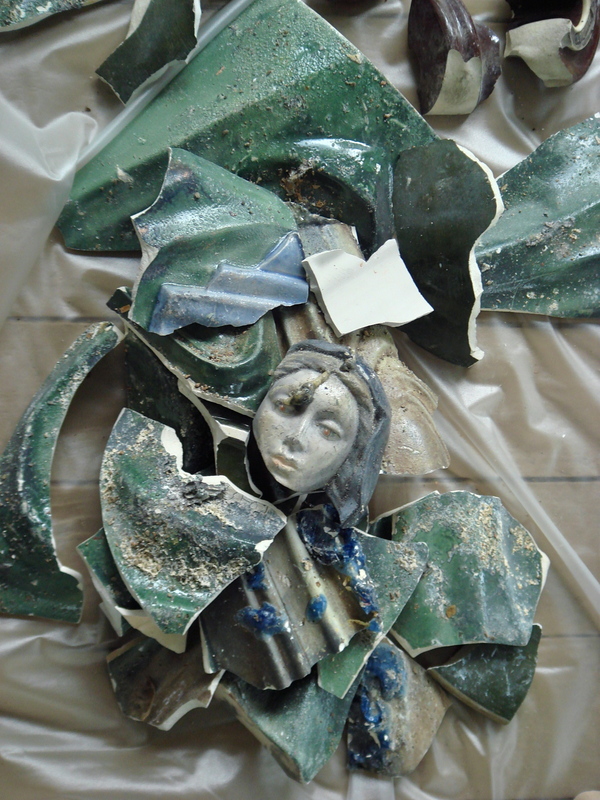 The only things that remained of the retreat center intact were made of stone or concrete such as the native stone labyrinth, the fire pit and concrete statues of Mary. The Bastrop Complex fire destroyed most of the Lost Pines Forest, a rare ecological niche and disjunct population of loblolly pine (Pinus taeda) trees thought to have originated in or before the Pliestocene era. The endangered Houston toad found in the forest is believed to have lost most of it’s habitat. The fire also consumed over 1600 homes. 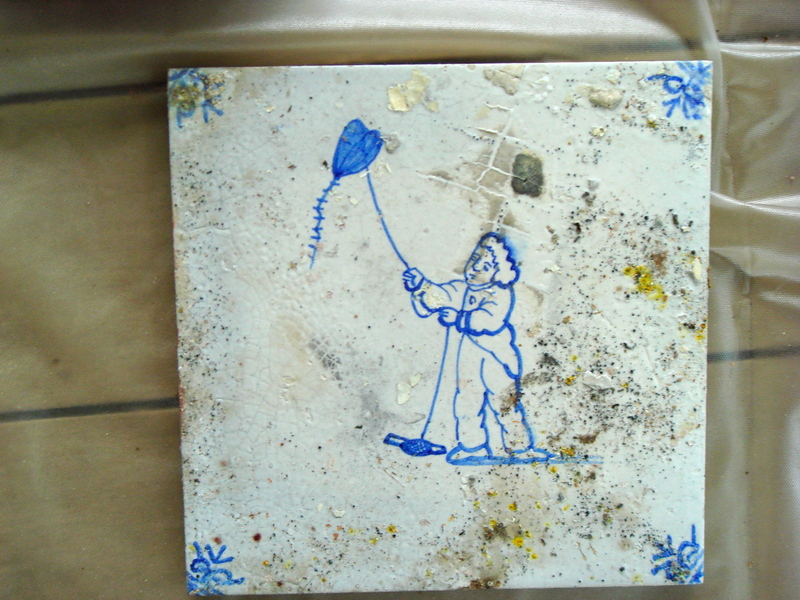 I am making a mixed media mosaic for a fundraiser in benefit of the restoration of PineCrone. 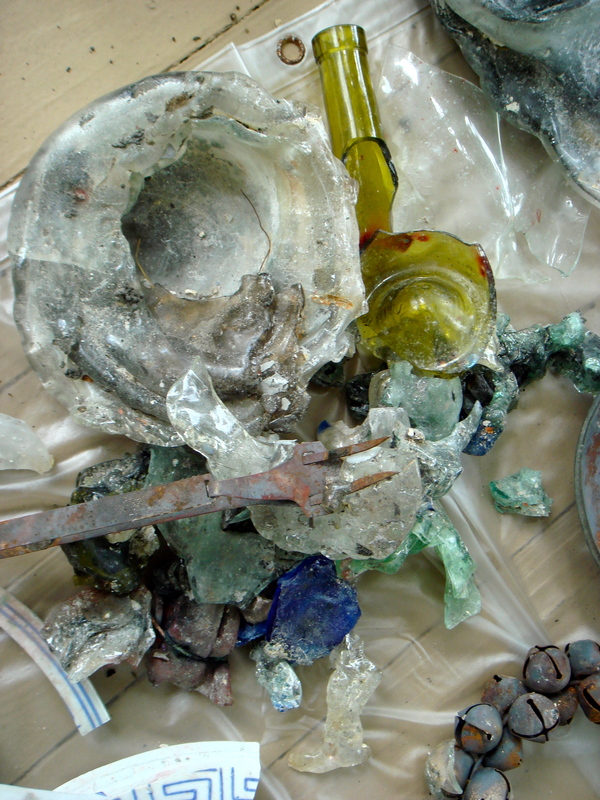 This week I received three boxes of shards picked up by the volunteers cleaning the land. 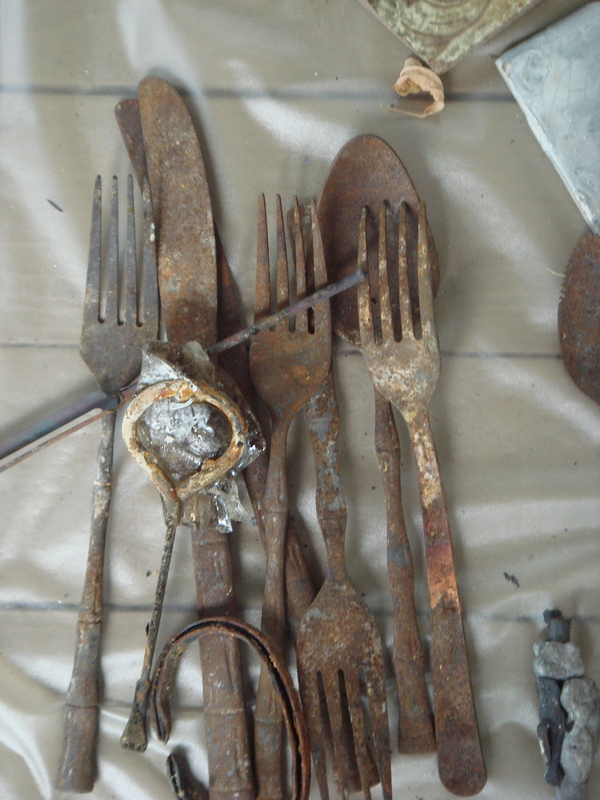 At first I was very reluctant to open them knowing how sad it would be to see the remains of my friend’s home but eventually when I did, I found a strange, poignant beauty in the debris. 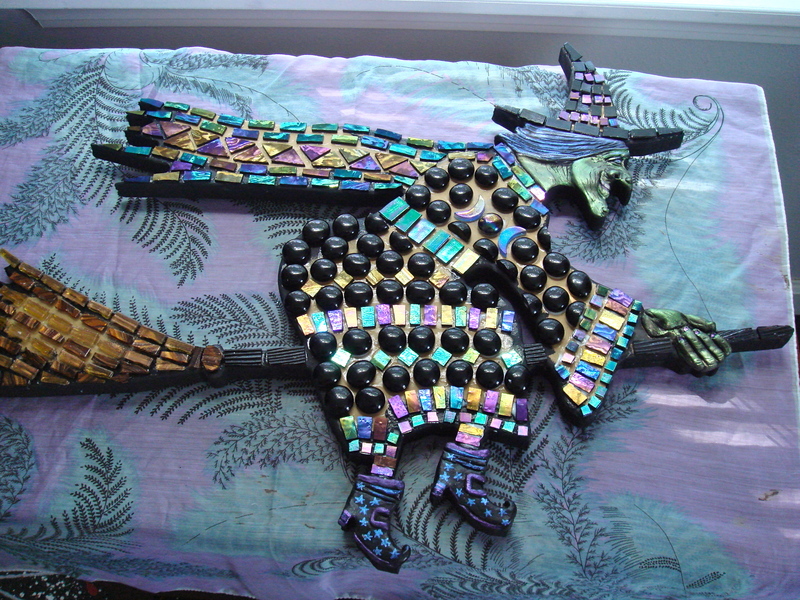 I will be using these in the mosaic, tentatively called “The Phoenix”. 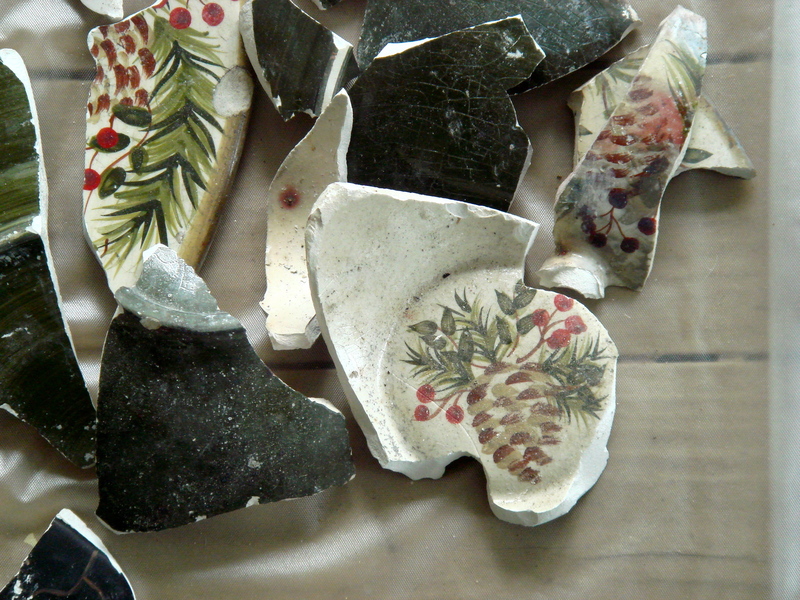 Here are a few photos of the shards.